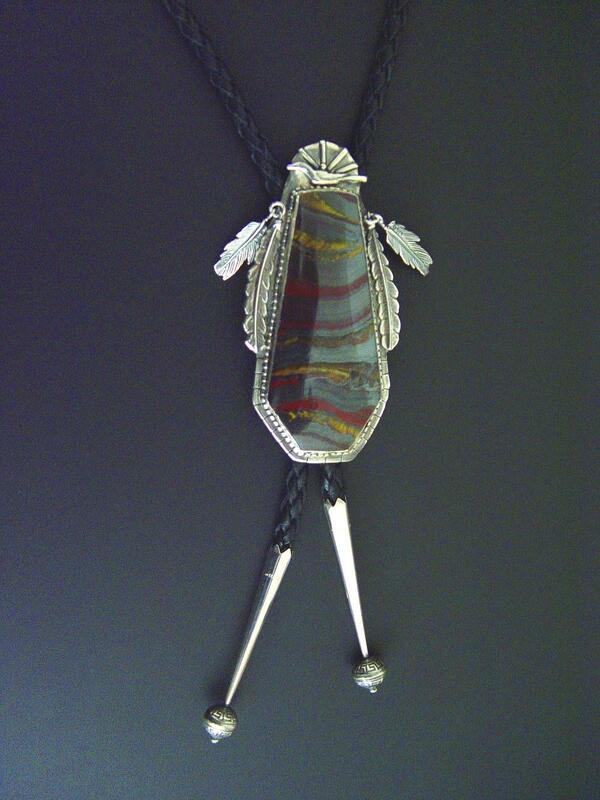 Bolo ties are the quintessential Southwestern acoutrement for men and women. 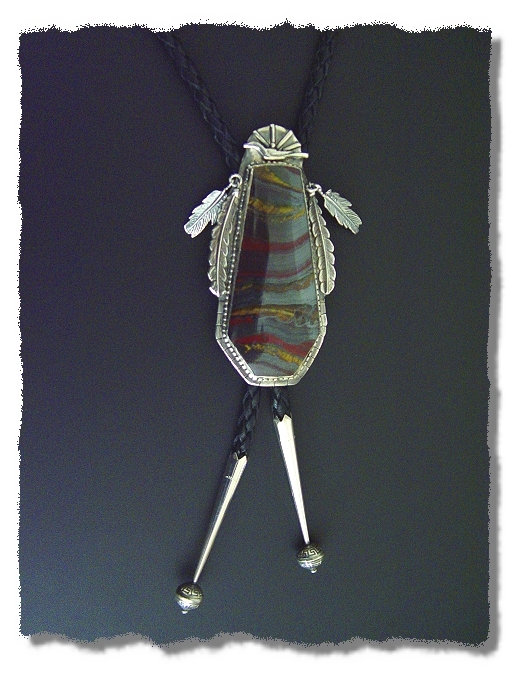 Leigh Becker cut this lovely piece of tiger iron in what seemed to me to be a tie shape, so what better use could there be than a bolo tie? Tiger iron is composed of bands of tiger's eye, red jasper and hematite. Many people are very fond of tiger's eye because of its fascinating chatoyance, a reflectance effect of a fibrous structure. In the case of tiger's eye, silica has replaced crocidolite (blue asbestos) fibers. I find the color of a large piece of tiger's eye off-putting, so I never use it. However, the thin bands of golden tiger's eye in tiger iron seem just right particularly with the red jasper in the hematite. Hematite is of course a form of iron (Fe2O3), thus the name "tiger iron." So... why is one called "tiger's eye" (possessive) and the other "tiger iron"? Inquiring minds sometimes ask silly questions don't they? Tiger's eye looks like a tiger's eye, in fact, the term chatoyance comes from the French meaning "eye of the cat." Tiger iron is simply iron with a tiger in it. Science News had a fascinating article a few years ago entitled The Iron Record of the Earth's Oxygen, research based on the banding patterns in banded iron formations (BIFs) such as tiger iron. These deposits formed in sediments roughly 2.5 billion years ago, and there are some extremely curious things about them. First of all, the iron portions contain about 20 times as much oxygen as today's atmosphere does and yet they formed at a time when the atmosphere had a much lower concentration of oxygen than it does today. The bands of jasper and chert in these deposits are iron poor -- how did they occur? The deposits can stretch for hundreds of kilometers and somehow they retain the banding pattern throughout that distance. You will have to read the article for all the fascinating details, but they include the discovery an extraordinary contemporary model of these ancient processes in Lake Matano in Indonesia. Suspicions center upon curious microbes called photoferrotrophs. Imagine wearing this little stone which could have formed over two billion years ago, sometime between the late Archean eon and the early Proterozoic, from iron thrust up from the core of our planet. It is no wonder Simmons and Ahsian give it attributes including stamina and grounding. Imagine the secrets it could reveal!